In the grounds of Morton Manor, Brading, Isle of Wight, PO36. Morton Manor is Grade II Listed. Since the War Memorial is situated within the curtilage of the Manor House, is it assumed that it is included within the Listing. A plaque to commemorate the wartime service of members of the Women's Royal Naval Service. 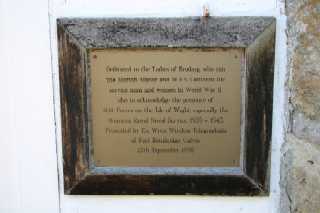 The plaque was unveiled on 12th September 1998. Womens Royal Naval Service, 1939 - 1945.